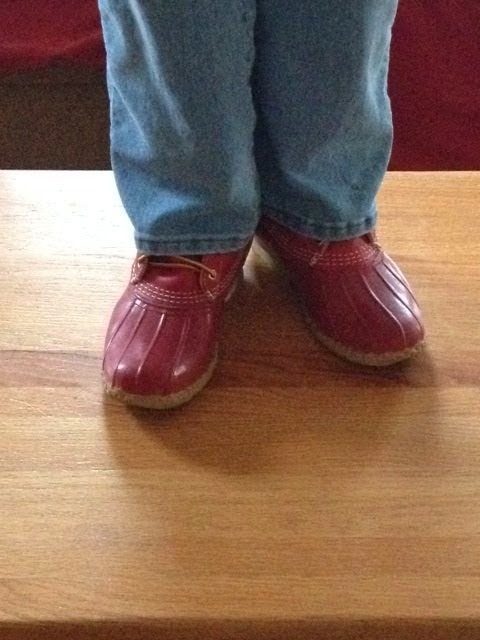 On Friday, my “cute little red boots” that I ordered from L.L. Bean arrived in the mail. Regular readers will remember that I ordered these on February 3*, 63 days ago. At the time, I was quite aggravated that they were backordered for two months and almost decided to forgo them. But at the urging of a L.L. Bean loving colleague, I placed the order and waited. I won’t be using their return policy. The boots are as cute in person as they are in the picture. I wore them all day Sunday, even though it was finally no-boots-required weather. While I am not quite the rabid L.L. Bean fan that others are, I will say that on Day 1 the boots were so cozy and comfy that I almost forgot that I was irritated about them two months ago. Almost. I think the lesson is that a great product is the trump card. A great product can cause people to overlook other transgressions. But if your great product has very limited supply or takes two months to make, don’t do things (like a feature in the Oprah magazine and Parade) to exacerbate the delay by escalating demand. If I’m this happy in March, just think of my glee had they come on a reasonable time frame. Currently I own enough Sharpie markers to write continuously for several years. I am a pen lover in general, but Sharpies are the creme de la creme — if you are only writing on one side of the page, they are perfect. I almost always have one within arm’s reach. In addition to the dozens of “regular” Sharpies that I have, there are two that have special significance: one, I used to sign a beam that is now in the World Trade Center and another was used for autographs at Cardinals spring training. I don’t know why I have such a fetish for this particular brand, but I do. I can barely walk by them in a store without wanting more. Maybe that is true, but I adore this product in an apparently boring and conventional way — I use them to write! But how can you take a lesson from Sharpie and use the web and social media to foster a community with your brand? Is there a product or service associated with your organization that you can encourage people to use in novel and even outlandish ways? I’m sure you could whip out a Sharpie and be inspired to create a wonderful plan on how to do so! Whenever I see the number 666 (as in this blog title), I am reminded of an incoming student we had several years ago. She was from a conservative religious background and the email address of her first roommate-to-be was something like devil666. It did not go over well. We had tears and parental involvement with lots of drama and trauma before she enrolled (in a different living situation). I wonder if she ever met “the devil” and if the impression that girl was giving off was authentic or put out there for shock value. In the admissions world, we see email addresses every day that I hope never make it to a resume: teddybear, bubblygirl, babycakes, froggy, squireprince, grossy, hogeybear, anklebreaker, or cheetahgirl. It may sound cute when you are a 16 year old high school student, but it doesn’t go far in impressing an admissions counselor or prospective boss. Email addresses have become the personalized license plate of this decade. Most people have their name and a number which is equivalent to the state-issued plates that have no personal character. But those who venture out to have nicknames or team names or favorite things can be equated to those who put coded messages or not-so-subtle designations on their licenses. Which way do you fall — trying to blend in or stand out? Either works, but take a minute to see if your 666 is unintentionally sending a message you didn’t mean to send. I was talking with one of my former employees yesterday and she recalled the time I said that she was doing “drive-by supervision” — managing staff in fleeting moments as if in driving by to check on a business without taking the time to go in and inspect the details. It works if you have great employees and you want to continue the status quo, but more is needed if you want to impact true professional development or plant the seeds to create significant change. One thing that is difficult for new supervisors to grasp is how much time it truly takes to supervise staff well. It is a continual, almost daily process in which information needs to be shared, context given, projects monitored in global terms, new challenges outlined, praise dispensed and questions answered. And that is when staff is all hired, trained and doing well! Supervision is also a hard skill to learn before you supervise someone. If you are mentoring new employees, do what you can to help them understand the process and have some components of the process: conducting the search for new employees, doing evaluations of interns, having 1:1 sessions with you even if they are not direct reports, taking a management class or attending a workshop or whatever you can develop. It has been said that people don’t leave jobs, they leave bosses. Do your part as a leader to train the future bosses so they can attract talent instead of repel it. Twice this year, I have waited in the exam room for a doctor who did not come after an hour had passed. No one else came either, to tell me that there was a delay or to say anything about the situation. Why is this seen as acceptable in the medical community? Not doing something plus a good reason does NOT equal doing something. If you’re late because of traffic, you are still late. If you bounce your check because your spouse didn’t write the last check in the register you are still overdrawn. If you come to work tired because your child was sick last night you are still unproductive. A good reason does not make things OK. I totally understand one doctor’s delay because he spent a lot of time with a patient. Today’s doctor had to tend to a situation that arose. If I am in need of physical or mental attention, I hope my doctor is there to provide it, even past my normal appointment time. But I do wish that the physicians would practice a bit of customer service with their medicine and tend to the other patients who are affected by their behaviors. I don’t begrudge their time with needy patients; I resent their disrespect of me. If someone is more than an hour behind, couldn’t they have told me this before I got there — or at least before I got undressed? If they didn’t tell me of the delay ahead of time, could they respect my time enough to let me get my walk in or do something besides sit only covered with a sheet on a metal table? Why not let me in the waiting room where there is a television, comfy chairs and heat? Even the airlines — never known for stellar service — keep you updated on the delays and ETA; couldn’t someone have told me something? Being a doctor plus a good reason does NOT equal acceptable behavior. Is your organization operating like these doctors? If so, I prescribe a dose of service to all the scheduled patients administered daily. Last night I went to a lecture by Mark Zupan, a gold medalist on the U.S. Paralympics rugby team. He wasn’t invited to speak because of his athletic pursuits, rather because he shares his story in order to help dispel myths about people with disabilities. At age 18, Zupan was involved in an accident after a night of drinking and ended up paralyzed. Rather than wallow in pity, Zupan claims that the accident was the best thing that ever happened to him. It allowed him to travel internationally with the rugby team, star in the movie Murderball that won the Sundance Film Festival award and landed him at the Oscars and have a host of experiences that would not have come his way otherwise. Zupan’s message wasn’t heroic or preachy — he was showing by example that people in wheelchairs can live. When asked what the biggest barrier was that he faced, he instantly answered in a loud voice: “HAVING PEOPLE TALK TO ME LIKE THIS! I’m short; I’m not deaf.” Zupan encouraged people to have normal conversations with people who are in wheelchairs and not treat them with kid gloves. He told stories of his friends who always made him drive because he got the best parking places, who borrowed his wheelchair to “get a better view” of the ladies, and who went with him at airports because they got to go to the head of the line. Zupan also spoke of his friend who was driving during the accident. “My dad took him aside and said ‘You are not at fault, but you are responsible. '” Zupan acknowledged that his friend had to deal with his own demons caused by not breaking his neck and seeing that Mark had. Whether you have faced visible adversity or are dealing with internal challenges, Zupan would say that the choice is yours whether or not you choose to live. Normal is what you make it. In 2005, visionary thinker Dan Pink wrote a wonderful book about what characteristics will be necessary and valued as the economy moves to a Conceptual Age. A Whole New Mind is as relevant now as it was then as we have more information than we can process and exponentially greater demands on our time and attention. Pink’s thesis is that as we move from the Information Age (knowledge workers) to the Conceptual Age (creators and empathizers), high tech is no longer enough. He maintains that we need high touch too. 2. Story — to construct a compelling narrative enhanced by emotion instead of just the raw data that is so abundantly available. 6. Meaning — significance and purpose — working toward something bigger than yourself. As I head into my employee “evaluation season” I am reminded that those who contribute most add attributes that go far beyond the tasks that they accomplish. Pink’s book may serve as a primer for you to think about how you are touching your organizational environment and the people in it.